Ambassador Conference Resort of Kingston, Ontario awarded Gold in the retail/hospitality category at an awards ceremony in San Antonio, Texas honouring the most successful corporate adopters of M2M (machine to machine/man) technology. At an awards ceremony in San Antonio, Texas honouring the most successful corporate adopters of M2M (machine to machine/man) technology, The Ambassador Conference Resort of Kingston, Ontario was awarded Gold in the retail/hospitality category. The cashless vending system implemented at the Ambassador allowed guests to either swipe their hotel room key card through the vending machine's card reader or use any mobile phone to purchase a variety of Coca-Cola beverages. Guests had applicable charges appear on their invoice at final check-out. The technology trial was unveiled as part of a larger makeover for the resort. The Value Chain Awards, chosen by a group of industry analysts along with editors of M2M Magazine, honor the most successful adopters of M2M technology and the team of solution providers that made their success possible. The award was presented to the Ambassador for demonstrating the process of combining multiple technologies to improve operations, reduce costs and enhance customer service. Results from the 90-day trial showed 99.9 per cent system reliability, no instances of attempted vandalism to the vending machines and, most importantly, extremely positive feedback from the guests themselves. 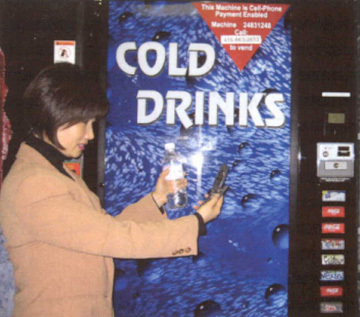 Stella Yoon, president of cStar Technologies, demonstrates cell phone vending in 2004. The Toronto-based company recently shared some honours for a cashless vending project in Kingston. "This award is the crowning achievement on what has been an extraordinary experience for the Ambassador Conference Resort," commented Venicio Rebelo, general manager for the resort. "The cashless vending technology has been a tremendous success both from a business and customer perspective, and we look forward to further applying this technology in other areas." Bell Canada spearheaded the cashless vending machine technology trial, which was the first in Canada to combine both mobile phone and key card technologies operating over a wireless network in the same trial period. Toronto-based cStar Technologies - a global provider of wireless (LAN/WAN) data communication solutions for M2M and mobile commerce applications - was a key partner in developing the project and RSI International Systems Inc.'s web-based property management solution RoomKey handles the vending transaction from credit authorization to transaction billing to hotel guest's room folio. The cashless vending system continues in operation at the resort.